My fertility journey with Genesis and Dr. Sonya Kashyap started well before I was ready to start a family. 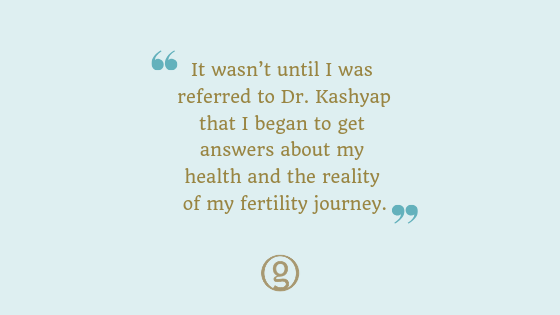 After seeing countless doctors ever since I was 15, it wasn’t until I was referred to Dr. Kashyap (at age 24) that I began to get answers about my health and the reality of my fertility journey. Right away Dr. Kashyap ran a bunch of tests, one of them being a genetic screen. I remember getting a phone call from Dr. Kashyap with the results and being in complete shock. It turns out I was born with one X chromosome and one Y chromosome, and my ovaries never fully developed into ovaries. The good news was I still had a healthy uterus that could one day carry a healthy pregnancy. While trying to comprehend what this all meant, I was immediately referred to a surgeon to remove my ovaries as they could be cancerous. The surgery was scheduled immediately, and after a couple weeks of recovering, the biopsy from my “ovaries” determined they were cancerous. The surgeon was confident the cancer was contained; however, I was sent for a PET scan just to be sure. The results of the PET scan determined that I still had cancerous cells in my body and I would have to start aggressive chemotherapy immediately. Although this was incredibly discouraging, my oncologist reassured me the diagnosis was positive and I had a very high chance of success. After 5 intense months of chemotherapy, the cancer was gone and I am hopeful it will never return (fingers crossed!). I could now focus on planning a wedding and starting a family. Two years after I finished chemotherapy, my husband and I met with Dr. Kashyap to start the process. Dr. Kashyap recommended we work with an egg bank in Seattle to source an egg donor. We had our first appointment via Skype, and they gave us access to the online egg bank to start viewing profiles. My husband and I looked at all the egg donors separately and we ended up choosing the same one! Once we had our egg donor chosen, the clinic told us it could take a couple months to create two high-quality embryos and that they would be in touch along the way to let us know how things were going. Well, after only two short weeks we had two high-quality embryos! They were shipped back to Genesis (we never had to go to Seattle once) and were ready for implantation. My husband and I couldn’t wait to get started! After a couple months of taking hormones to prep my uterus, we had one embryo implanted. We waited two very long weeks to get the results of a blood test that would determine if I was pregnant. I remember getting the call at work and running down the hall to the boardroom; the amazing nurse told me the good news – you’re pregnant! I had been waiting my whole life for this, and after thinking it might not be possible it made it that much more special. My pregnancy was great. 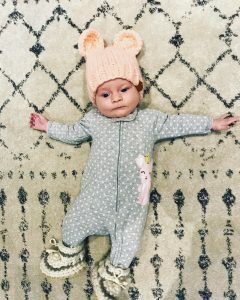 I had no complications and I delivered a beautiful healthy baby girl at 38.5 weeks. She is perfect, and our whole family couldn’t be happier to have her in our lives. She is truly a miracle. I honestly can’t thank Dr. Kashyap enough for all her hard work and expertise – we couldn’t have done this without her. We are forever grateful and can’t wait to try for baby #2!